Need more information about booking Home 7260637 ? my name is Mirna and I am your host, running my grandfathers house in beautiful Baška. Apartment Julia have beautiful view from the balcony - the sea, mountain Velebit, the forest an Baška bay. It is small apartment, around 27 square meter size, with double bed + 1 sofa for two. It can accommodate maximum 3 adults + child. Apartment has bedroom, living room, bathroom, kitchenette and balcony. It also has an air-conditioner, wi-fi and a satellite TV. You can find little dog beach just down the house. The beach is just 30-40m from the house, the woods and mountains are by the house, perfect for trekking, mountain bike and herb collecting. Baška center is 10min. walking distance from the house. Even during busy summer season it is quiet and peaceful, and during off-season it is perfect place for meditation and restoring you energy. Baška is really beautiful old village with lot of history. 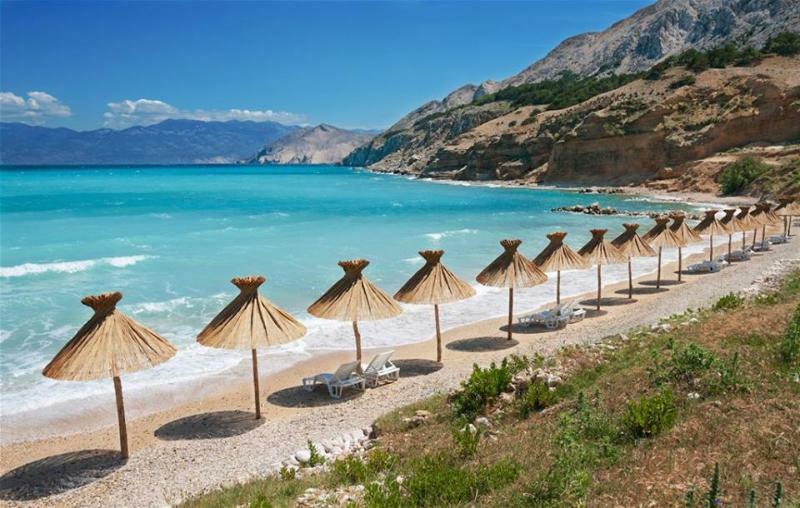 Its surroundings is very beautiful, with 2,000m long sand and pebble beach, various wild beaches, vineyards, olive and fig trees, mountains and beautiful view of Velebit mountain and Prvić island across the bay. It is one of the most popular places on Adriatic Sea so it is hard to find free place to stay during the summer. The old part of village is wonderful especially if you like strange organic architecture. Once you come here, you will be back ... everybody does :). You can enjoy great fish food, local specialties and wine in restaurants, or you can have a coffee or cocktail at the beach bars. Island Krk is also famous for lamb meals. Island sheep and lambs are running free around Baška, and they eat aromatic herbs (we have more than 300 different herbs around), so you can imagine how tasty it is. In April, we have wild asparagus festival. The sea is beautiful and sooo clear. It's temperature during the summer is 25-26C. When we have bura wind (cleansing colder wind) the sea is turquoise and just beautiful. Perfect for wind surfing! Baška is popular among wind surfers, and you can enjoy many water sports here. You can also rent a taxi-boat with a driver if you want to visit one of the many wild beaches that are around Baška. Or maybe you can visit some other islands or National Park Plitvice or you can go to Venice for a day. ***Please note that this apartment is very popular during the summer season so you need to double check availability with your host Mirna by making a request before booking. Simply use the request box in the top left hand corner of this page. ****The price for 1 to 3 nights is 30% higher than normal price during peak season. Ottima posizione dell appartamento fronte mare...unIco problema che in Agosto come in qualsiasi altro posto c'è troppa gente.La propietaria molto disponibile e gentile tutto ok per quanto riguarda il soggiorno. Siamo stati nel ponte del 2Giugno era deserta e fantastica Baska.